It was not that it was not a productive roam. It was. But, somewhere around hour three of many jumps and various amounts of waiting the entire fleet was just tired. It is odd how tired one can get, roaming. A random exhaustion creeps across the entire fleet. Maybe we are too old. At some point Titus announced that it was only 2200 as someone logged out in space. And it was true. It was not super late but everyone was dragging and tired. And then Titus bubbled the Skarkon gate in L4X as we staggered back into Low Sec because why not. Of course, our scout was European and so very sleepy towards the end. It was a very good roam. I managed to be late to the start which bothered me. However, making dinner is more important than my Eve roams. I figured I would catch up in an interceptor but it seems that I was needed as DPS. That was unexpected. I've almost forgotten what it is like to be a pewpew fleet member. I was able to grab the ship type from corp contracts which was also a new experience. Now I was the owner of a shiny, artillery fit Rupture. I even remembered to change into my empty jump clone this time. Our fleet was not large. A Scythe for logistics. A Sabre to bubble gates. A Stiletto to scout and six Ruptures for damage. The composition of the null sec fleets is different from the composition of low sec fleets. For one, we have someone who can create bubbles. For two, interceptors are on the field as the primary tackle force. We tend to go for a more cohesive fleet composition. Not having a point on my ship feels very, very strange. A bit naked in a way. As if a piece of my engine is showing from under my engine trails. Off we went. An Omen died at a district the first jump out. It was sitting, with one gun filled with a singular tactical crystal to deliver one sad, burst of energy towards the Dust fight. A destroyer would have been a cheaper loss and more damage if I understand the mechanics correctly. 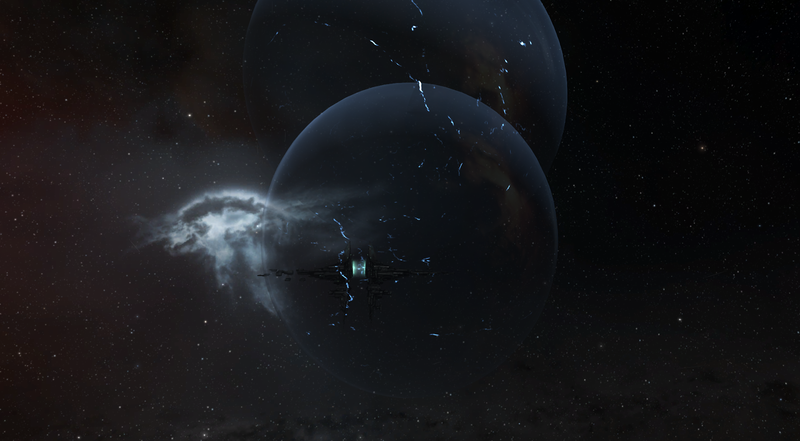 Off we went into null sec. There was some basic plan. I was cheerfully eating my dinner. The nice part about not being tackle or scout is the freedom to do other things like warp, hold, and jump while chomping on dinner. I had made buffalo chicken salads and making the chicken is what made me late for fleet. Now I happily folded lettuce around bits of chicken into tiny, bite sized wraps and buzzed along with the fleet a s I luxuriated in eating as slowly as I wished. There was a lot of waiting and trying to find people. There was the occasional warp to the wrong gate because we kept going away from the auto-pilots path. There is something amusing about sitting on the correct gate, the FC saying jump, and clicking "jump" on the yellow gate, only to find yourself in warp across the system. Whoops. We found a fight in one of our target systems when the scout jumped into a bubble camp composed of a Hurricane, Moa, and Celestis.We raced to catch up as he had to decloak and pointed the Hurricane. He was immediately damped by the Celestis. The fleet came in and we started to burn down the Celestis and kill the Hurricane. A Blackbird, Drake, and Prophecy warped in. I think they warped into our bubble that we put up. However, they were trapped. We had to chase down the Celsitis and the Blackbird. Avoiding bubbles. Running around in various ranges. There were a lot of little things to do. I managed to burn up my cap at one points. To much micowarp drive. Once that was done we started killing everyone else. Another Drake wandered into the party for some reason. It died as well. It was a very neat, if one sided fight in the end. Our next stop was another system that was also occupied by the same people. They did not wish to come out and play. For residents of low sec who spend their time fighting to fight and fighting for various goals, the lock down of a system by a very small fleet seems odd. However, locked down they were. I was reminded of the 'don't engage them because it encourages them," mantra I have heard before. It is very true. Roaming gangs such as our own are prone to boredom. The guys tried some random fleet invite type games but no one was honestly biting. After chasing some of them around for a while we decided to leave and start heading home. We'd been out for quite a while and people needed to work in the morning. DP didn't make it back. He logged out in space. The rest of us kind of free burned back to Molden Heath from deep null sec. At some point, as we were almost home we wound up landing on a gate with a cruiser gang. The artillary Rupture needs distance. Our plan to burn and start to shoot went surprisingly well. We killed a Caracal that had tried to point the Sabre and chase us. They tried to kill the Scythe. The entire thing didn't work out for them. The others stopped chasing us but someone went for our Stilitto who pointed him and we warped in and killed him as well. As we did that, the rest of the gang bailed leaving us with two dead Caracals. "I need to go dock for shields,"
"Sugar, we have a Scythe," says Van as Evel in the scythe starts to rep me. It seems that when they were going after Evel at the start of the fight I had mentally decided that he was to busy staying alive. Somehow, that meant he was gone off wild and free being alive somewhere that was not within rep range. I want to believe that I was just tired. The chances are high that I was. The pointless, artillery Rupture was an adventure. It is a fleet ship. I like fleet ships. When we were chasing down the Celestis and Blackbird I remember thinking that I needed to not ram them because I was in an artillery ship and my engagement range had a few more options then in the face.